Analysis: Gore and Ivory are somewhat similar at this stage of their careers, so there was only need for one and the Bills went with the soon-to-be 36-year-old. We'll see if the team brings in another running back through the draft, but for now Gore seems locked into that No. 2 role, with the unproven Marcus Murphy being the only threat to his expected workload. 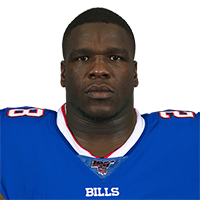 Gore is signing a one-year, $2 million deal with the Bills, Adam Schefter of ESPN reports. Analysis: The ageless veteran will continue his career in Buffalo after the Dolphins did not re-sign him. Gore ran for 722 yards in 2018 while averaging 4.6 yards per carry, one of the highest marks of his career. He stands to add backfield depth behind LeSean McCoy and Chris Ivory. Gore (foot) intends to continue his football career even if the Dolphins don't re-sign him, Barry Jackson of The Miami Herald reports. Dolphins running backs coach Eric Studesville doesn't know if Gore (foot) will be offered another contract, Barry Jackson of The Miami Herald reports. "The biggest thing with Frank is let's get Frank healthy and then we will cross all those other bridges," Studesville said. Gore won't require surgery for his sprained foot, Ian Rapoport of NFL Network reports. Analysis: Gore's injury is significant enough to sideline him for the Dolphins' final two games and a potential playoff run, but it's nothing that should impact his preparation for 2019. According to Adam Schefter of ESPN, Gore is still hoping to suit up for a 15th NFL season, with the veteran eyeing another year in Miami if he and the Dolphins can work out a new deal. Kalen Ballage and Kenyan Drake will handle the brunt of the work out of the backfield for the remainder of the current campaign. Coach Adam Gase said Wednesday that he doesn't know if Gore (foot) wants to continue playing football after the 2018 season, Joe Schad of The Palm Beach Post reports. Gore (foot) was placed on injured reserve Wednesday. Analysis: With Gore -- who led the Dolphins with 722 rushing yards on 156 carries through 14 games -- now out for the season, the profile of rookie Kalen Ballage in the Miami offense is set to expand down the stretch. Like Gore before him, Ballage is expected to handle most of the early down work while Kenyan Drake offers a change-of-pace option and picks up the bulk of the snaps on passing downs. Special-teams standout Brandon Bolden could also earn a slight uptick in opportunities as the No. 3 back. Gore (foot) isn't expected to play again this season, Adam Schefter of ESPN reports. Analysis: After initial X-rays came back negative, Gore was scheduled for an MRI on Monday to check for ligament damage. The Dolphins have yet to comment on a diagnosis, but they should have an update at some point Monday or Tuesday. With the 35-year-old running back likely to miss the rest of the season, Kallen Ballage is set to join Kenyan Drake for a new 1-2 punch in the Miami backfield, though Brandon Bolden might also get a few touches. The Dolphins host the Jaguars in Week 16. Gore (foot) is scheduled for an MRI on Monday to see if he suffered any ligament damage, Adam Schefter of ESPN reports. Gore was spotted leaving the Dolphins' locker room Sunday with his left foot in a walking boot, Adam H. Beasley of the Miami Herald reports. Analysis: Prior to his exit from the Dolphins' 41-17 loss to the Vikings, Gore carried five times for 14 yards. With his Week 16 status up in the air, Kalen Ballage -- who led Miami on Sunday with 12 carries for 123 yards (highlighted by 75-yard TD run) -- is worth a speculative add. Kenyan Drake, who had been splitting backfield work with Gore, carried just once in the contest for six yards and caught all three of his targets for 28 yards. Gore was forced out of Sunday's game against the Vikings with a foot sprain, Ian Rapoport of NFL Network reports. Analysis: On the plus side, X-rays on Gore's foot were negative, but his status for next Sunday's game against the Jaguars is unclear. In his absence, Kalen Ballage's profile in the offense has a chance to expand, while Kenyan Drake remains on hand to see his share of Miami's backfield work, with Brandon Bolden in reserve. Gore was carted off the field during Sunday's game against the Vikings after suffering an ankle injury, Adam H. Beasley of the Miami Herald reports. Analysis: Gore is a tough player, but we'd be surprised if he was able to re-enter the contest. In his absence, added touches in the Miami backfield are available for Kenyan Drake and Kalen Ballage. Gore rushed 12 times for 92 yards and caught his lone target for 24 yards in Sunday's win over the Patriots. Gore rushed eight times for 21 yards and brought in his only target for 10 yards during Sunday's 21-17 win over the Bills. Analysis: Gore received less snaps (20) than fellow running back Kenyan Drake (30), and saw his lowest amount of carries in a single game since Week 3. The veteran's 31 total yards are close to his floor in Miami, so it's reasonable to expect that Gore will bounce back against the Patriots on Sunday. Gore is worth considering as a flex option for fantasy purposes. Gore carried 14 times for 67 yards and caught one pass for an additional 10 yards during Sunday's 27-24 loss to the Colts. Gore carried 13 times for 90 yards and caught two passes for an additional 12 yards during Sunday's 31-12 loss to the Packers. Analysis: Gore enjoyed a strong day on the ground, averaging 6.9 yards per carry against a respectable Green Bay front. He touched the ball 15 times to Kenyan Drake's 10 and was much more effective with his opportunities. Gore averaged just 3.2 yards per carry on 42 totes over the previous three games, so this was a nice bounce-back effort for the veteran. He'll enjoy a much-needed bye before taking on the Colts in Week 12. Gore carried 20 times for 53 yards and caught one pass for an additional six yards during Sunday's 13-6 win over the Jets. Analysis: Gore received 20 carries for the first time this season, but some treacherous field conditions and a matchup with a respectable Jets front limited him to 2.7 yards per carry. He was a virtual non-factor in the passing game once again and finished with an underwhelming day despite the hefty workload. Even when Gore does receive the majority of the work over Kenyan Drake in a given week, the results have varied from game to game. This should remain the case next Sunday against the Packers. Gore rushed 12 times for 53 yards and brought in one of two targets for five yards in the Dolphins' 42-23 loss to the Texans on Thursday. Analysis: Gore and Kenyan Drake split the rushing work evenly, although the latter outpaced the veteran by five yards and one touchdown. Gore has now logged double-digit carries in five straight, giving him a seemingly trustworthy workload for the moment. The 35-year-old will look to continue producing versus the Jets in Week 9. Gore ran for 29 yards on 10 carries and added a four-yard catch during Sunday's 32-21 loss to the Lions. Gore rushed 15 times for 101 yards and caught his lone target for 18 yards in Sunday's 31-28 overtime win over the Bears. Analysis: Gore saw a near-even split with Kenyan Drake (78 scrimmage yards on 13 carries, four catches), though Drake fumbled on Chicago's 1-yard line in overtime after Gore gained one yard from the two on the previous play. The 35-year-old running back's first 100-yard rushing game in a Dolphins uniform gives him some momentum ahead of a favorable Week 7 matchup with a Detroit defense that's been gashed on the ground. Gore may continue to pace the Miami backfield in carries while Kenyan Drake handles more of a change-of-pace/pass-catching role, Armando Salguero of the Miami Herald reports. "Frank does a really good job of, 'We're second-and-five, third-and-two.' Or it's we're first down, second down, first down," coach Adam Gase said Thursday. "Kenyan is coming along in that area, it's just that he does give you that element of first-and-10, you get a 60-yard touchdown, where it's a game-changing play." Gore rushed 12 times for 63 yards but wasn't targeted in the passing game during Sunday's 27-17 loss to the Bengals. Analysis: Gore got 12 carries to Kenyan Drake's six, but Drake actually finished with one more touch than Gore thanks to seven receptions. While the 35-year-old Gore's role isn't significant enough to carve out much value in standard formats, it's definitely been large enough to cut into the more explosive Drake's value. Their frustrating timeshare should continue against the Bears in Week 6. Gore rushed 11 times for 41 yards and brought in two of three targets for 16 yards and a touchdown in the Dolphins' 38-7 loss to the Patriots on Sunday. Analysis: The veteran back somewhat surprisingly paced the Dolphins in rushes while Kenyan Drake saw only three carries. Gore also scored the Dolphins' only touchdown of the afternoon, which also marked his first trip to the end zone of the season. It's difficult to determine what the division of labor will be in the Miami backfield on a week-to-week basis, but Gore has now seen between nine and 11 carries in three of the first four games. He'll face off with the Bengals in Week 5. Gore rushed six times for 12 yards in Sunday's 28-20 win over the Raiders. Analysis: Gore saw one more carry than Kenyan Drake, but neither running back received a large enough workload Week 3 to achieve fantasy relevance. Miami's offense played only 39 snaps in the efficient victory, and mostly attacked Oakland's defense through the air, so expect the team's running backs to see larger workloads in most weeks. The 35-year-old veteran nonetheless lacks weekly starting upside as long as he splits carries with Drake. Gore rushed nine times for 25 yards and added a 19-yard catch on his lone target in Sunday's 20-12 win over the Jets. Analysis: This was a special day for Gore, who passed Curtis Martin for fourth on the NFL's all-time rushing list. Otherwise, Gore was out-touched 15-10 by Kenyan Drake, who got into the end zone from six yards out in this one. The veteran running back's lone catch was a huge one, as he picked up just enough on a 3rd-and-19 checkdown late in the fourth quarter. Miami subsequently gained one more first down and ran out the clock. Gore rushed nine times for 61 yards and wasn't targeted in the passing game during Sunday's season opener against the Titans -- a 27-20 Miami win. Analysis: Gore came in needing 75 yards to tie Curtis Martin for fourth on the all-time rushing list, leaving him just 14 yards short after a strong showing. Kenyan Drake got 14 carries to Gore's nine, lending credence to a depth chart that surprisingly listed the two running backs as co-starters. Drake's still the player to own in Miami's backfield, but Gore appears primed to work in more than just a change-of-pace role. Gore (non-injury) returned to practice Friday, the Sun-Sentinel reports. Analysis: After taking a day of rest Thursday, Gore was back in action in his usual capacity (full) Friday. Nonetheless, the veteran running back is in danger of ending his consecutive start streak of 108 games. The Dolphins are expected to start 2017 breakout Kenyan Drake at running back Week 1 and beyond, but Gore should still have a meaningful role out of the backfield. Gore (not injury-related) did not practice Thursday. Gore and Kenyan Drake are listed as co-starters on Miami's depth chart ahead of its Week 1 matchup with Tennessee. Gore is expected to miss Thursday's preseason game in Atlanta, Alain Poupart of the Dolphins' official site reports. Gore is expected to see some action in Saturday's preseason game against the Ravens, the Dolphins' official site reports. Gore could make his preseason debut against the Ravens on Saturday, Cameron Wolfe of ESPN.com reports. Gore won't play Friday night against the Panthers, Armando Salguero of the Miami Herald reports. Analysis: With Gore being rested and Kalen Ballage (concussion) not playing, Kenyan Drake is slated to start at running back for the Dolphins on Friday, though his healthy backups figure to do much of the heavy lifting in the team's backfield, given the preseason context. Gore won't suit up for Thursday's preseason game against the Buccaneers. Analysis: Inked in the offseason to bolster the Dolphins backfield, Gore was listed as a co-starter with Kenyan Drake on the team's initial, unofficial depth chart. The preceding likely doesn't mean much due to Gore's age (he turned 35 in May) and Drake's explosive second half in 2017. That said, Gore figures to play some sort of role with his hometown club, whenever he does take the field. The Dolphins' current posted depth chart lists Gore and Kenyan Drake as co-starters, the Sun-Sentinel reports. Gore is expected to have a significant role in the Miami offense, rather than simply serving as a mentor to Kenyan Drake, Hal Habib of The Palm Beach Post reports. "We got caught in a couple of situations last year where Kenyan was the only guy we had and he had to take the majority of the carries," said Dolphins coach Adam Gase. "Really, that's not what we want over a 16-game season. We'll make sure that we spread this thing out well. We'll use both of those guys the right way." Analysis: Drake did hold up to a heavy workload over the final five weeks of last season, but he struggled to stay healthy at Alabama despite playing limited snaps behind Eddie Lacy, T.J. Yeldon and Derrick Henry. With Miami's backfield depth otherwise lacking experience, it isn't out of the question that Gore pushes for 8-10 touches per game in a backup role. Damien Williams, who is now with the Chiefs, had 46 touches in the four games he played last season after Jay Ajayi was traded to Philadelphia. Gore isn't expected to participate much, if at all, during team drills this spring, Adam H. Beasley of the Miami Herald reports. Analysis: After inking a one-year deal with Miami in March, Gore will suit up for only the third different team in his extensive NFL career. It appears the 35-year-old will take his time learning the playbook and reserve reps for minicamp, or possibly even training camp. There's no discussion of an injury at this point, so it's quite possible that Gore's limited action during OTAs is just designed to preserve his body. Gore's one-year contract with the Dolphins contains a $1.015 million base salary and $90,000 signing bonus, Aaron Wilson of the Houston Chronicle reports. Gore has signed a one-year deal with the Dolphins, ESPN.com reports. Gore is meeting with the Dolphins on Thursday, the Miami Herald reports. Gore is nearing an agreement with the Lions, Mike Jones of USA Today reports. Colts head coach Frank Reich said Wednesday that general manager Chris Ballard informed Gore that the veteran running back likely wouldn't be retained in 2018, Mike Wells of ESPN.com reports. Gore had 24 carries for 100 yards and three receptions for 11 yards in Sunday's win over Houston. He became the fifth player in NFL history with more than 14,000 yards rushing. Analysis: He has 14,026 yards rushing in his career. Gore says he plans to play in 2018, but it seems unlikely he'll return to Indianapolis with a rebuilding team. Gore finishes the season with 961 yards rushing and four total touchdowns, but just 3.7 yards per carry. Gore rushed for 68 yards on 17 carries and added 18 yards and a touchdown on two receptions during Saturday's 23-16 loss to Baltimore. Gore rushed 10 times for 31 yards and brought in three of four targets for 37 yards in Thursday's 25-13 loss to the Broncos. Gore (hand) doesn't carry an injury designation heading into Thursday's game against the Broncos. Gore was listed as a non-participant on Tuesday's injury report with rest and hand designations. Analysis: On the heels of his most productive outing of the season -- 140 yards from scrimmage in the snow Sunday at Buffalo -- Gore is getting some time off on a short week to receive a bit of rest. That said, his hand is also bothering him at the moment, so his status will be worth watching in advance of Thursday's game against the Broncos. Gore carried 36 times for 130 yards and caught one pass for an additional 10 yards during Sunday's 13-7 loss to the Bills. Gore rushed 13 times for 61 yards and wasn't targeted in the passing game in Sunday's 30-10 loss to the Jaguars. Analysis: Gore came in seventh on the NFL's all-time career rushing list, but passed Jerome Bettis (13,662) and LaDainian Tomlinson (13,684) over the course of this one to move up to fifth. The 34-year-old running back got seven more carries than Marlon Mack, but rushed for only 15 more yards than his younger counterpart. With double-digit carries in all but one game this season, Gore still provides a decent floor due to volume despite playing in one of the league's least effective offenses. Gore rushed 17 times for 62 yards and a touchdown while turning five targets into two catches for 17 yards in Sunday's 20-16 loss to the Titans. Gore rushed 17 times for 54 yards and brought in his sole target for seven yards in Sunday's 20-17 loss to the Steelers. Gore rushed 17 times for 51 yards and caught three of four targets for 26 yards in Sunday's 20-14 win over the Texans. Analysis: The lone incompletion thrown Gore's way was an ugly drop on 3rd-and-short. He was solid otherwise, out-touching Marlon Mack 20-9 with neither getting into the end zone. Gore continues to get decent volume, but lacks major upside at this stage of his career.